Soritids are large calcareous foraminiferans abundant in Indo-Pacific coral reefs. 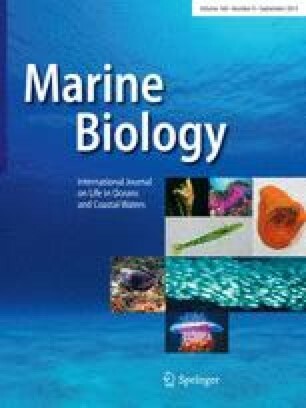 Soritids are known to host endosymbionts morphologically and genetically similar to Symbiodinium-like dinoflagellates commonly found in corals and other marine invertebrates. In order to examine the phylogenetic relationships between symbionts present in foraminiferal and coelenterate hosts, we used DNA sequencing and PCR-based RFLP methods to analyse 157 foraminiferal and 110 coral DNA samples from 12 localities in Guam (Micronesia) collected in July 1999 and December 1999. Ribosomal DNA sequences were obtained for 14 foraminiferal and 12 coral samples. Sequence analyses allowed identification of six different Symbiodinium phylotypes among soritids and two phylotypes among examined coelenterates. A single phylotype, previously described as lineage C, was common in foraminiferans and corals. The PCR-based RFLP analysis of 157 foraminiferal and 110 coral samples shows that lineage C dominates coral symbiont communities, accounting for 78% in both sampling periods. On the other hand, our data show that lineages C and Fr6 dominated foraminiferal symbiont communities in July 1999 versus a clear predominance of lineages C and Fr3 in November 1999. The other three phylotypes present in soritids (Fr1, Fr4, Fr5) were uncommon and seem to occur seasonally. The phylogenetic analysis of the present data indicates relative specificity of soritid symbionts compared to other Symbiodinium-like dinoflagellates, but the causes of this specificity are not yet understood.